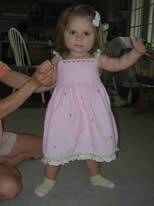 Our daughter Isabella (we call her Bella) was born on August 10, 2005 exactly on her due date. A beautiful 8lb 11oz baby girl seemed to be a perfectly healthy newborn. Our 2-day old little princess took a helicopter ride to UNC Chapel Hill because she stopped eating, was lethargic and very acidotic. Heartbroken, we spent 2 weeks with her there, waiting for her to recover and learning about her disorder. She is a very severe case. 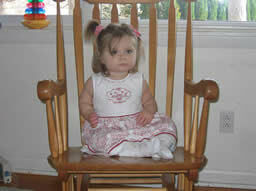 She got her G-tube placed at 7 months, her port-a-cath at 19 months. She completely stopped eating by mouth around 11 months. She was hospitalized numerous times. Bella is 22 months old now. She isn’t walking yet or talking. She started showing a little interest in toys. Her baby brother is making her play with him. Her two unaffected brothers Luke 7 and Jack 8 months absolutely adore her. Our family is blessed with three beautiful children.